This '8x8 Vingnette' concept started with 'The Dark Knight - Interrogation Scene' vignette which was based on the #40120 Valentine's Day Dinner and #40121 Painting Easter Eggs. 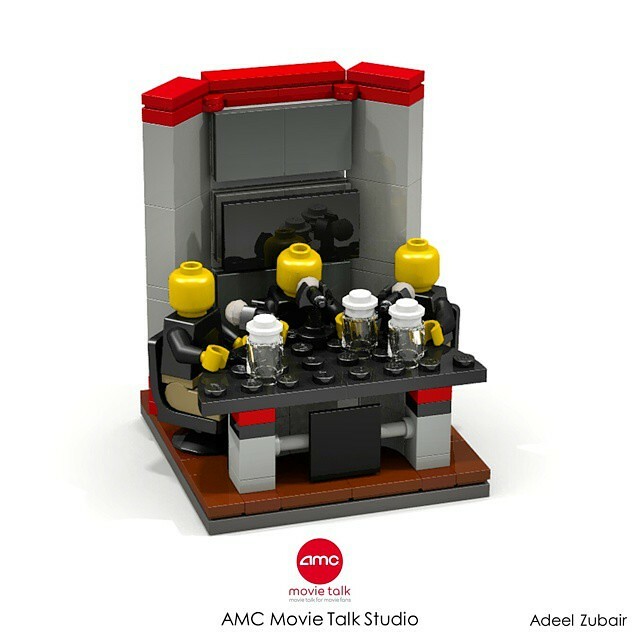 This one represents the 'AMC Movie Talk' studio in Burbank, California. The hardest part was to make it accurate as possible due to is contemporary design and curves, such as the table and back wall. This would include three minifigures: John Campea, Jon Schnepp and Dennis Tzeng. I have avoided the graphics on the faces since it's a nightmare to find them on LEGO Digital Designer. It would also include three AMC logo patches and one laptop. This one needs a few stickers and gaphics to make it more accurate such as the screens and the graphics on the walls. I wanted to post this week since yesterday was John Campea's last show. I will definitely will re-upload this when I own the parts and design the stickers and graphics. I really hope you enjoyed this MOC; feedback and criticism is much appreciated. Love this series man, not really familiar with the concept, but it does look great. Aw man, I've been so sad Campea is leaving. But great MOC overall- can't wait to see the final thing.